Stop this crazy machine! 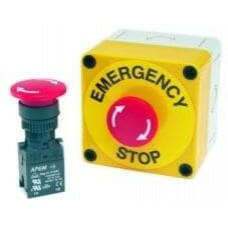 Are you looking for the perfect emergency stop button for your project? Look no further. 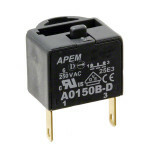 It’s Apem’s 24 mm Emergency Stop Switch! A bright red safety switch you can add to your project to tell everyone what button it is that shuts it all down. Roughly the diameter of a quarter, just push to engage, then twist to release. But the fun doesn’t stop there! You can use this button for any number of purposes and projects that might require a red, push/twist button. Note: The yellow "Emergency Stop" enclosure is not included with this product. Panel thickness : 6 mm (.236) max. This is a single pole switch contact block for use with an assortment of emergency stop switches inc..